Architects and interior designers are creative people, pragmatic people, analysts and problems solvers. And the tools we use to accomplish our tasks involve pen, paper and most often, a computer. We sketch on a computer. We research products on a computer. We communicate via a computer. You get the drift. We spend a lot of time behind a computer screen. So, when one of our designers, Megan Conner, put on a helmet, stuffed a role of drawings in her messenger bag and pedaled away on her bike, well, we were all a tad envious. Megan had started work on an accessibility evaluation of multiple Minneapolis Park and Recreation facilities. Her task was to identify accessibility items – like ramps and doorways and bathrooms – for improvement and, in consultation with MPRB staff, schedule and manage the subsequent work. As the weather was good when she started this park and rec project, it seemed appropriate to cycle her way from site to site. 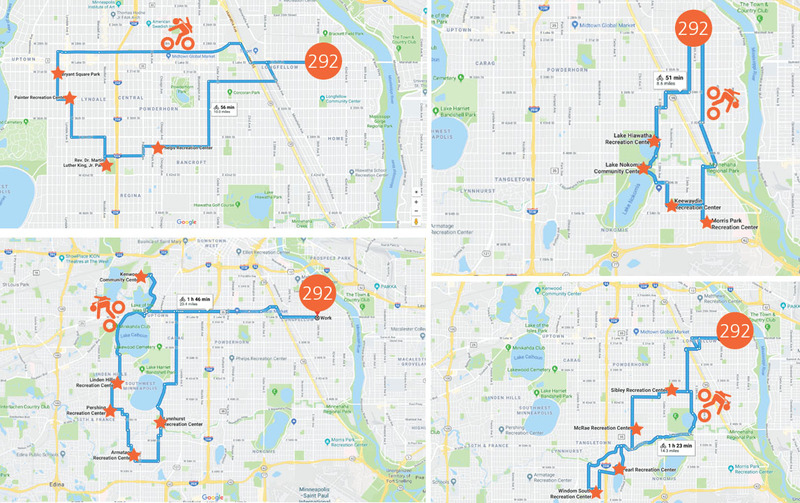 For a week, Megan plotted her bike route, covering a different segment of the park system each day. She’d return in the afternoon to compile her notes. For the second consecutive year, the Minneapolis Park system was named the Nation’s Best Park system by the Trust for Public Land. According to the trust’s scoring system, 97% of people in Minneapolis live within a 10-minute walk of a park; 15% of the city area is reserved for parks; and the median park size is 6.5 acres. In addition to all that, Minneapolis has launched a 20-year funding plan for maintenance and capital improvements. That’s where 292 comes in, and that’s how Megan came to spend a week evaluating park facilities to help ensure that everyone has access. Here are some things that Megan had to say about her time biking – and working – in our country’s top park system. There are so many facilities, which means there are so many parks! Some buildings are tucked into quaint neighborhoods and used by nearby residents for daycare or when at the adjacent playground, while others are off main streets and used for multiple programs, like a gym or pottery or yoga classes. The facilities are truly wonderful amenities and reflect the nature of the neighborhoods they’re in. I thought the Bryant Square Recreation Center was really nice. It was small, had great mosaics on the side of the building, was well taken care of, and had some funky flare. The architecture of other buildings I saw was also unique – many curves and a total retro vibe. Many of the more distinctive structures were designed by local architect, Milo Thompson. Did you find any gems? There were quite a few amazing neighborhood pockets that I had no idea were there. As I was biking along Upton Street, I was stunned by the cedar-lined Red Cedar Lane adjacent to Minnehaha Creek. The neighborhood was established and developed by John Jager. Jager was a Slovenian architect who immigrated to Minneapolis. After establishing his career and getting married, he purchased about 20 acres along Minnehaha Creek and started developing what’s now Red Cedar Lane. Many of the houses along the lane were designed by the local architects William Gray Purcell and George Elmslie. Jager met William Purcell at a lecture and the two became friends. I had no idea such an architectural gem of a neighborhood existed in Minneapolis. How did you like working from your bike? How did it feel at the end of your bike/site tour? I’m a fair-weather biker, but during that week of 70-degree weather, cycling to the project sites was amazing. Although, by the end of the longer 15-mile routes, I was getting pretty worn out. If it were something that became part of my daily work schedule, I would get more storage for my bike so I wouldn’t have to carry my bag on my back all day. All in all, it felt so good to get moving and to be able to enjoy all the outdoor scenery, lakes, bike routes and neighborhood parks that Minneapolis has to offer!